“What makes a watch enthusiast? Like many others I suspect it starts early and for me with one significant event triggering the compulsion. The catalyst appeared on my tenth birthday over sixty years ago but is still fresh in my mind. The unwrapping of a small square box revealed, quite unexpectedly, a pocket watch, but not just any pocket watch, no Roman Numerals or engine turned registers on this timepiece but the most wonderful and highly coloured scene on some distant planet showing Dan Dare “Pilot of the Future” confronting a writhing space creature armed only with his trusty ray-gun which he waved with regular precision! On the back of the watch was an engraving of a large raptor and the word “Eagle”. Dan Dare was the leading character in that famous comic of the time “The Eagle” whose adventures along with his trusty sidekick Digby and often involving his arch enemy and evil genius The Mekon were eagerly awaited weekly by children everywhere. Fifteen years later in 1969 the real adventures into space began with Apollo 11and the first moon landing. The three astronauts however did not carry ray guns or Dan Dare pocket watches but they did wear mechanical watches in fact Omega “Speedmasters”. During the actual moonwalk I understand only Buzz Aldrin wore his watch, Neil Armstrong left his in the space capsule as a backup in case the official timing mechanism for the crucial rocket burn failed. 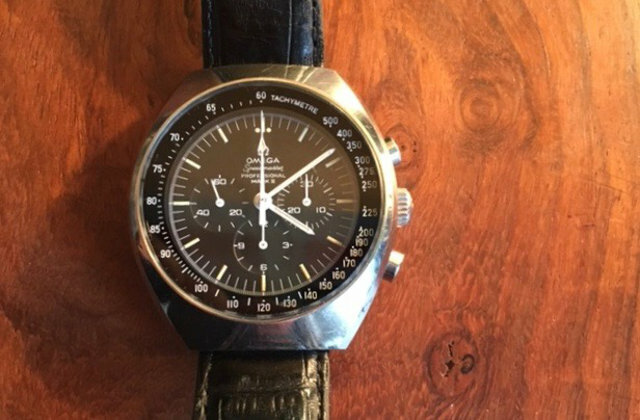 NASA had selected the Speedmaster Chronograph for the mission after extensive testing of many of the top brands of the day including Rolex. Originally designed as a sports watch for car enthusiasts, its origins go back into the 1950’s. My particular example of this model sourced from Black Bough is dated as Circa 1969 and, unlike the originals, features a chunky 42mm wide tonneau-form case which is impressively large even by current standards. Its matte deep space black dial with luminescent hands and numerals features three subsidiary dials and is surrounded by a bezel calibrated for tachymeter and chronograph pushers to ensure precise timing for those critical rocket burns. The screw down back shows not an eagle, but the Omega seahorse emblem. Manually fully wound, the calibre 861 movement will easily run for two days and, even after 47 years, keeps excellent time within a couple of minutes a week. This is the fourth in a new series of posts where our customers write about a favourite piece they have bought from Black Bough.